Models for Change is the John D. and Catherine T. MacArthur Foundation’s long-term, $100 million investment in creating more fair, rational, effective, and developmentally appropriate approaches to juvenile justice. The foundation began making grants in the juvenile justice field in 1996, following years of harsh legislation that threatened the foundations of juvenile justice in this country. These laws restricted juvenile court judges’ traditional discretion to deal with individuals on the basis of their needs, curtailed their jurisdiction, did away with confidentiality protections, introduced punitive new sentencing approaches, and required the transfer of more and more youth to the adult criminal system. In 2008, CJJ was very pleased to facilitate the inaugural “Champions for Change” Awards, celebrating the accomplishments of extraordinary individuals dedicated to the goals of Models for Change, who were nominated by their colleagues in recognition of their work to create effective approaches to improving the lives of young people, while inspiring us all with their determination to succeed. CJJ proudly serves as the host of the Annual Models for Change Conference, in partnership with the MacArthur Foundation. 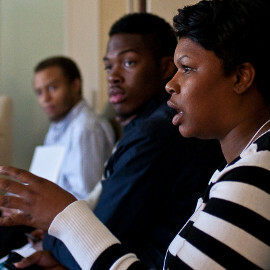 Each year, nearly 300 state leaders and national resource experts in juvenile justice reform convene for the conference.